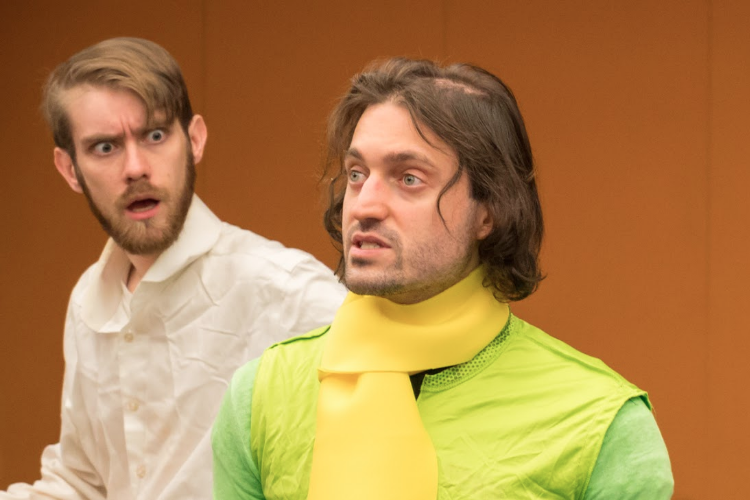 William Ketter and Anton Spivack in The Little Prince. Photo by Ric Sechrest. BOTTOM LINE: A joyful adaptation of The Little Prince from EPIC, a neuro-inclusive theater company in residence at the Flea Theater. “Sometimes when you talk to me about things, I can’t appreciate how important they are to you,” the jaded Aviator, once a wide-eyed painter, tells The Little Prince’s title character. The tale’s interest in fostering mutual understanding, in advocating for careful listening, and in exploring the ways that adult expectations shape the way we see the world as we grow make this dramatic adaptation of Antoine de Saint-Exupéry's classic work an apt selection for a staging by EPIC, a neuro-inclusive theatre company. EPIC, which has taken up residence at the Flea Theater downtown, features performers with and without developmental disabilities. Part of the lesson of EPIC’s inclusive casting of The Little Prince lies in the diversity among its alter-abled (the company’s preferred term) performers. Expectations of how disability might or might not manifest in performance should be left at the door; this is as varied and individual a cast as any other. There are delightful performances in the smaller roles as well: Samantha Elisofon is an exuberant Rose, the Prince’s beloved flower left behind on his home planet, all bubbly shrieks of glee; Gideon Pianko’s King acts amusingly pompous as he attempts to demonstrate his power over the stars; and Kim Carter makes for a ticklingly austere Businesswoman. Late in the play, Miles Butler steals scenes as a hyper, and hyper-charming, fox, determined to be tamed by the prince. Of the myriad retellings, EPIC has chosen John Scoullar’s faithful but dramatically inert 2000 adaptation (it’s actually the song-less incarnation of Scoullar's own earlier musical version). Scoullar’s translation to the stage of Saint-Exupéry’s weird, wondrous dialogue largely results in a series of static, two-person conversations, but director Travis Burbee infuses these with the artistry of a pair of chalk-drawers (Jesus Chevez and Talia Eapen) who bring the story to visual life in real time. In one particularly lovely sequence, Elisofon’s flower blooms beneath her as petals and stems expand in chalk around her feet. There’s also wistful piano-centric underscoring throughout from composer Ray Dodd. More moments of ensemble storytelling and staging—as in the opening storm sequence—might have helped capture the book’s sense of surprise, but Burbee’s well-paced direction still follows a coherent path through the Prince’s episodic journey. One of The Little Prince’s surprising joys, though, came post-curtain call, when EPIC’s artistic director Aubrie Therrien invited cast members to speak about their experiences performing with the company. Few theater visits offer such glimpses into the heart of a cast and theater company (audience members were also generously treated to boxed dinners upon arriving), but the post-show speeches made evident that EPIC can continue to deliver on its promise of transformation for audiences and company members alike, regardless of what adults tell us makes us different from each other. The Little Prince is by John Scoullar, based on a book by Antoine de Saint-Exupéry. Directed by Travis Burbee. Set Design by Ryo Tatsumi. Lighting Design by Zach Weeks. Sound Design by Isabella Scappaticci. Costume Design by Cat Fisher. Original Music by Ray Dodd. Stage Manager is Kylie Hogrefe. The cast is Anton Spivack, William Ketter, Miles Butler, Samantha Elisofon, Imani Youngblood, Kim Carter, Nick Moscato, Gideon Pianko, Gianluca Cirafici, Ben Hill, Jesus Chavez, and Talia Eapen.